SEIZE DC! Because, well, we're sick of the sociopaths! 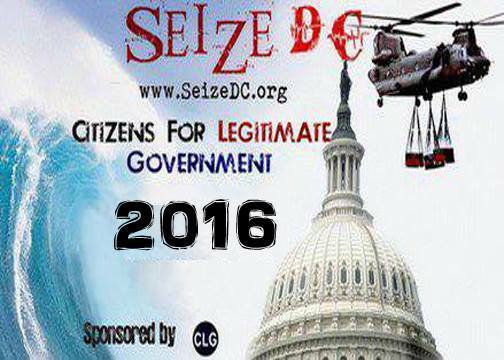 Citizens for Legitimate Government, http://www.legitgov.org/ (CLG) calls for protest – SEIZE DC! Endless, illegal, murderous and bankrupting war abroad; endless, brutal and bankrupting attacks on the vast majority at home—this is what we protest. Ten years ago, with the illegitimate installation of Bush as "president," Citizens for Legitimate Government made it its mission to expose the coup and to oppose the Bush occupation of the White House. We predicted that the installation of Bush was merely the precursor to an era of illegal and undemocratic undertakings on the part of the U.S. government--policies that had begun at home and that would extend across the globe. Unfortunately, we were right. And we were right to say that this era would not and has not ended with Obama. In fact, it continued unabated and gained in intensity. In 2008, we witnessed a supposed change of guard with the election of Barack Obama. But even before the election took place, we suggested that Obama, rather than being an agent for change, was in fact a cleverly constructed mirage to enable the financial, corporate and military oligarchy to continue on the same course, in fact, to do so with without the degree of opposition that was building to the Bush regime. What we have witnessed is not 'change you can believe in,' but, where Obama and most Democrats in Congress are concerned, belief you can change. From Bush to Obama, we have seen not a change in policies, not a reversal, not even a 'failing' to change course, but the exact opposite: a determined continuation, extension and increase of the very same policies. Rather than an end to imperialist wars, we have witnessed the increase in scope and the extension of war into other countries. Rather than two wars, we now have four. Rather than policies favouring 'Main Street' as promised, we have witnessed the unprecedented transfer of wealth into the coffers of the banks, corporations and military contractors. We have seen record corporate profits while social misery for the working classes continues to rise, with unemployment not seen since the Great Depression and record home foreclosures. We now have austerity imposed on the vast majority while those who caused the financial crisis with wars, bailouts and corruption, pay little or no taxes and enjoy record profits. Instead of restoring civil liberties, we have seen their further erosion with the extension of the Patriot Act, the increase of surveillance on the web, and a declaration by the president of the right to assassinate American citizens without any legal sanction whatsoever. Indefinite detentions have not only continued under Obama, but he has also made sure that proven innocence is no cause for release. This is but a short summary of the reasons for SEIZE DC! We protest "peacefully," although not passively. We do not accept marching orders. This is how we protest. For 10 years, we have witnessed the absolute formalization of protests—the seeking of permits, the placing in quarantined zones, the appropriation of 'free speech' and the pro forma 'right to dissent,' treated as a purely formal and meaningless expression. We say, enough! We need no permission to free speech or the right of assembly. We seek no one's permission and will not have our protest cordoned off from and made irrelevant to the functioning of a murderous and tyrannical oligarchy. We will not be corralled or controlled. Our protest is a seizure of DC, by which we mean an attempt to seize the attention of the city and the nation so that its policies of seize and destroy may end. More details on the protest schedule to follow soon. Sign up to receive Seize DC alerts! Seize DC calls for you and/or your organization's endorsement. Contribute to this action by clicking here.